May 14, 2014: I hate people who say they hate people who say they don't have a TV. 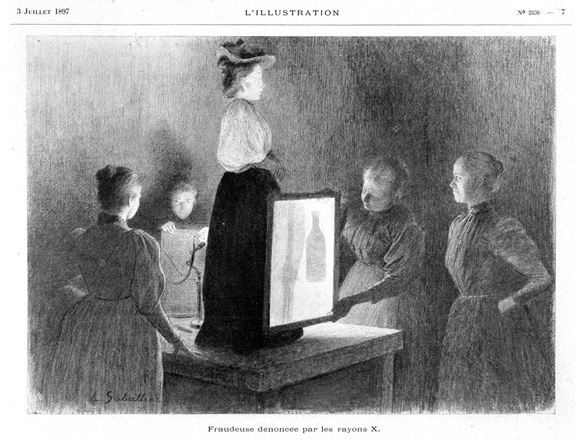 "A fraud is exposed, thanks to a handy fluoroscope and her cooperation. Why she is hiding a bottle beneath her skirts remains unclear." Hey, I made the opening for once! Hi Irwin. Only because he was late, Carm. There are two kinds of people in this world; those who perpetually divide the world into two kinds of people, and those who do not. Ah, the early days of the TSA. Fraudeuse dénoncée par les rayons X.
I enjoy the pun on "unclear." hey irwin! others! week is almost over...sorta! Irwin, it's Sidney Bechet's birthday today. Just sayin'. Looks like she's also hiding a bony old leg under that skirt! Sacre blu! wow! this is the osmonds! never woulda thunk it. Irwin is the great reputation re-evaluator. It could be a big bottle of mouthwash, non? Maybe she has halitosis, non? Michael Jackson, s'il vous plait? They sounded a little like Oingo-Boingo. always loved this stone roses tune. reminds me of being a carefree young-un. Yeah, I really liked that song. Irwin's Head: A new comedy, this fall on Fox! Should be the theme song of the Loser's Lounge. Fwank, I like your style. This also sounds like Oingo-Boingo. With a penguin walking through it. Maybe I should just listen to some Oingo-Boingo. WH, I always thought every Oingo Boingo song sounded the same (it's definitely the same guitar part on every song), except for "Lost Like This", which is a superbly written, scored, performed, and recorded. Impossible to believe it's on an Oingo album. To a man with Jan Hammer, everything sounds like Oingo Boingo. Add a good man and everything sounds Like Children. Dean, do you mean "like chicken"? No, Jaune, children do not taste like chicken. Oh, okay, if you say so. The good drummer on the album Good God by Good God is Hank Ransome, who's other album credit is on Elizabeth by the band Elizabeth. Coincidence? I think not. Irwin, that was outstanding. Never heard Good God before. I read online among the one hit wonders a band out Austin called Master Cylinder is quite good as well. I wish I could go but I am too far away! I love Ken and Andy. I have what I think are some nuclear zingers. Irwin, I admire your courage for playing this on WFMU. Could these production values be recreated today? Jaune: Stimulator's a pretty good album, genre-wise. It captures the '80s zeitgeist, while having been recorded in 2004. WTf, OMG, surprised that was recorded in 2004. I thought the song was just pretty good and dated. Sometimes I love dated. Just my opinion. The Sutherland Brothers WITHOUT Quiver. The Sutherland Brothers BEFORE Quiver. That means this is around 70-72 era? Quiver also has a self-titled album but no track named Quiver. So many close calls today! I love anything owl-related, because they are really cool birds. This is a pretty good song by and about owls too. I love James Wolf too. Thanks for the wolves and owls, Irwin. James Wolff's voice is so...different. Always makes me look up from whatever I'm doing. Not that I was doing anything other than listening to the program, of course. We don't know what you're doing down there, but as you can see from the playlist image, they're working on technology to detect you doing it. You've been warned. I see "Earlimart" and I always think "7-11". Could that be his intention? never heard this chumba cover! thanks, irwin. Just star clicked this one. Love it. oh, looks like chumbawumba covered him! aw, followed by kiss. you know i'm listening, don't you irwiny"
I'm in yr head, KG. Andy's pool is not likely open yet. But soon. Will Andy show everyone his masurbatorium? Seven Second Delay might not be a technical disaster today. As they always say, "miracles CAN happen." @rsj: i also love performance. very strange and great! mick's music video in the middle of the film is a high point for me! @ Carmichael: Those attending the picnic should insist that Andy skip the "guest masturbatorium" and show them his private, personal masturbatorium. It's the Third Son from the Stone, innitt? Oh. my. God. It's an Amanda tornado. Aah, I come back from the copier to find Amanda in my cubicle. Who WOULDN'T like that, I ask you? Hey. I'm informed that Irwin's going to be on David Garland's "Spinning on Air" on WNYC this coming Sunday. A program about Sun Ra's centenary. Irwin hasn't mentioned it, so I will. But this one isn't up there yet. Open the windows so they don't get blown out! @ Ken: Who's got Blondie tonight? Conan? Letterman? I saw Blondie last summer, as the official spousal unit. Really, I don't see what the big deal is. In fairness, they had the ill fortune to follow Devo, who blew the doors off of the joint. Podcasts make it better for those of us on The Other Coast. @ DJ Irwin: With David Garland this week? Far out, Man! @P-90 - Blondie is on The Daily Show on Comedy Central tonight (11:00 - 11:30 PM Eastern). Thx, P-90. I see I confused the composer with the DJ. My mistook. I stand corrected on the Tony Seymour track! NOT outsider music. A cool neo-beat musical collaboration. Touche Irwin! Thank you. @Ken: wouldn't ya know it, a guy from Jersey is hosting them. Tony recently was diagnosed with cancer. Any song with whistling is a cool laid-back song. @ Ken: Thnx. That's a "get" for Jon Stewart! Like Spinning on Air scoring Irwin for Sunday! I come here for things like this. Irwin, So, by that reasoning, ELP has the best songs? ELP have warehouses full of Grammies because they use a LOT OF NOTES. What a scene, what a scene. "....somebody get me a ladder!" Wayne is an example of a singer who does not use a lot of notes. He has never even been NOMINATED for a Grammy. I know what Fritos are--what's Dejados? One-Note Samba kinda undermines Irwin's thesis. "One Note Samba" is just the title. It actually contains 16 notes. It's like "One-Hour Dry Cleaners." They don't really get you back your clothing in one hour, "It's just the name of the shop, love. We take three weeks." Will Andy have a rabbi to bless the hotdogs? Is listener John a serial killer? Will Andy's obnoxious son hog the camera? So many questions, so few minutes. That was music to De Beers ears. A Joe Frank BBQ would be awesome. The rabbi would be a prostitute. The hot dogs would be specially imported from Lithuania. Everybody would be compulsively talking about their careers. I want to go to a Joe Frank BBQ. Thanks Irwin! Yet another close call with BDoD! Have a fun week, yinz!